“Elizabeth, a woman rebuilding her life in New York City, discovers a world of infinite possibilities. In one moment, Elizabeth will lead parallel lives. Norway is the first European country to stage the musical, and it is Det Norske Teateret (The Norwegian Theatre) who’s had the honour of putting up the show. The theatre is known for putting up Norwegian-speaking plays only, so clearly this version is a translated one, and it’s also been adapted for the Norwegian audience, in terms of names, references and setting. 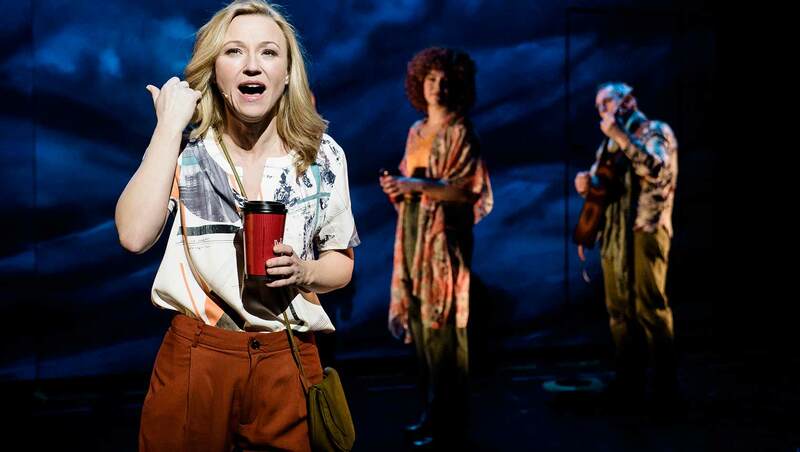 The original play is very New York-centered, and I’ve read some discussions on American forums that people have even been concerned about its touring potential outside New York City, will it have the same appeal outside the Big Apple? I have to admit I’m always a bit skeptical about seeing translated versions of musicals, and in Norway it’s always a bit 50/50 if something will be translated or not. With The Norwegian Theatre I know everything is in good hands though. I’ve seen Sweeney Todd there previously, which was fantastic although translated and changed up quite a bit from the English-speaking versions I know of. It’s a fantastic theatre with some amazing people working there, cast and creatives. I therefore had quite high hopes today as a friend and I headed down to see it for the first time. In If/Then’s case, or Tenk om in Norwegian, the changes are quite big from the original New York-version, but I found that it really works. Admittedly, I haven’t seen the Broadway version, but I’ve listened to the soundtrack and know the story, so I do feel I have some ground for comparison. In the Norwegian version of the show we find ourselves in the city of Oslo, Norway’s capital, and we follow Marianne, whose life could have gone two different ways depending on a small choice one ordinary day. In the two different paths Marianne is now “Mari” or “Anne”. Heidi Gjermundsen Broch is incredible as the lead character Mari/Anne. The Oslo-setting feels very natural, and as an Oslo-citizen myself I found myself really appreciating all the references and love for the city, and never once was I thinking “you can tell this was actually made for New York”. The translators and director have done a great job making everything work for a different kind of audience than the original show was intended for, something which is a hard task indeed. What is really similar both in the original and adaptation is the thoroughly urban feel, and the freshness of a truly modern musical. Here you have modern everyday problems, diverse characters you can relate to and feel for and everything feels very real. And all this is especially brought out with the excellent performance of the lead characters and ensemble. Heidi Gjermundsen Broch plays the lead character, the role that was originated by Idina Menzel on Broadway. Big shoes to follow many would say, but I’m actually going to go as far and say that I prefer what I saw and heard of Heidi live, than how Menzel is on the soundtrack and clips I’ve seen. Of course, Idina is AMAZING, and it’s an unfair comparison seeing as I haven’t seen her live, but Heidi has such an amazing voice, stage presence and charisma, that is quite simply one of the best I’ve witnessed. The leading role of this show is a big challenge, as you’re practically in every scene, playing two different versions of the same character, and you have some big numbers to belt out. Broch did this and more, and at the same time truly excelled in the more intimate, emotional scenes as well, and at times left me teary-eyed. I really did enjoy the musical score throughout the show, but it’s not exactly that type of musical which has tunes you immediately catch on to, and start humming to the minute you leave the theatre. There are some wonderful duets, big emotional ballads, impressive ensemble numbers and more, but I have to admit most of them are not something I’d listen to a lot just to enjoy the music, they work more as a part of the show, and not so much on their own. This is of course a very subjective opinion, as I know a lot of people love the soundtrack and listen to it frequently. All in all, I liked the show a lot. The amazing performances and the freshness of the modern setting are the true highlights, and a musical that’s been criticized for being “too New York” to succeed anywhere else has surely proven its adaptability by getting great reviews from the Norwegian press. The Norwegian writers have truly done a great job handling the story and presenting it in a slightly different way, which will hopefully be an inspiration to other theatres throughout the world to do the same. 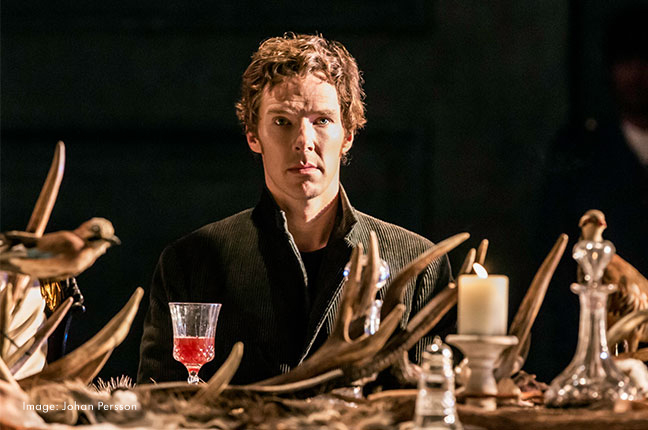 Hamlet at the Barbican – in Oslo! Yesterday (Thursday October 15th) I had the great fortune of seeing Hamlet on the Barbican in London, from Oslo! The play with Benedict Cumberbatch was being broadcast live to hundreds of cinemas all over the world, and I was lucky enough to be seated in one of them. Watching from the atmospheric and old Gimle Cinema you almost felt like you were actually sitting in a theatre. Almost. I love the idea of live theatre being broadcast world-wide and thus gaining a wider audience. Cinema can never fully capture the magical feel of theatre, but some plays certainly look good on the big screen, and Turner’s Hamlet is absolutely one of them. The staging almost makes you think it was designed to be filmed from the start. There are some absolutely beautiful scenes using different lightning techniques, slow motion and special effects. Since you’re watching the play through a camera lens you get a lot of close-ups of the action and the actors, which works well in this piece. At the same time it’s a shame that you don’t get to take in the whole stage when you want to, or decide what part you want to focus on.Anyway, that’s just nitpicking, and does of course not ruin the experience. Benedict Cumberbatch does a great job portraying Hamlet, he is incredibly intense, vulnerable, funny and most of all real. He delivers some incredibly touching moments, I had to admit I shed a tear during both “To be, or not to be” and “What a piece of work is man“. The entire cast does an incredible job of course, but besides Cumberbatch I especially enjoyed Kobna Holdbrook-Smith as Laertes and and Karl Johnson as the Ghost of Hamlet’s father. When taking in a play, and especially something like Shakespeare with its beautiful language, the actor’s voice, rhytmn and intonation are so important to me, to make me connect with their character, and these three in particular especially delivered on that part. If you have the opportunity to watch one of the reruns that are being sent many places worldwide, I highly recommend it. To find out where you can still watch the production that was filmed October 15th, click here to find a list of cinemas and dates.